GEISAI was back after one year and a half!! After a one and a half year hiatus, GEISAI is back and more powerful than ever!! Since 2002, events have been held regularly twice a year but these reached a certain level of completion with GEISAI#10. The theme to that point had been the creation of a new art market and to that aim, artists were invited to directly sell their work to audiences, creating new avenues previously unseen in Japan. Since then, it truly does seem as if the contemporary art sector is expanding and also increasingly providing an influence for the fields of fashion and design. And as was the goal along, we have also seen art collection become more of a more cultural norm. As GEISAI itself was being expanded, many artists who exhibited at the fair were also given chances to participation in exhibitions at Foundation Cartier pour l’art contemporain in Paris, as well as in prominent art fairs around the world, such as in Basel and Miami. In this way, the artists were able to hurdle over the challenges of the Japanese market and emerge directly on the world stage. 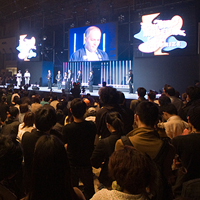 Now, in May 2008, GEISAI starts anew and seems to have taken on bigger ambitions than ever. 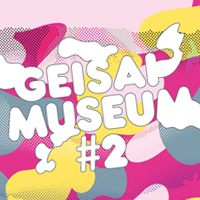 Beginning with GEISAI MUSEUM#2, which condenses all the elements from now into one package, the invited jurors were mostly directors at prominent museums. In addition, rather than selecting three prize winners and certain special prizes, all 700 artists present will have their work assessed. The fair still managed to retain some of the school festival/flea market like atmosphere that has made it so much fun but added to this skeleton by inviting Van Ness Wu from the Taiwanese super unit F4, voice actress Aya Hirano, and the idol group AKB48, who hail from Akihabara. No longer a place just for exhibitors, GEISAI had now become an event in its own right, for visitors as well. If we were to analogize with the movies, we would note that like “Star Wars” or “Batman”, it is usually the second episode where the universe of the story begins to take on more depth and surprising truths are revealed, along with stronger enemies. If the GEISAI events 1-10 were part one, I dare say that part 2 has only just begun.